[+] Quick load key now works during the death movie. [+] Game window is resizeable. [+] StretchWidth and StretchHeight parameters specify the factors by which the game area gets stretched to reduce black bars on the sides. StretchWidthFull and StretchHeightFull parameters are used only if it makes the game occupy the whole screen. [+] Now in Software rendering mode the view is always scaled linearly, which makes it less flickery. [+] Data\MouseLookCursorHD.bmp is used for mouse look in 32-bit color mode if window is bigger than 640x480. [+] Customizable mouse cursors: Data\MouseCursorArrow.cur and Data\MouseCursorTarget.cur are used if present. [+] Patch now bypasses dgVoodoo DLLs if SupportTrueColor is not disabled. [+] Minimaps zoom level is remembered always, not just outdoors as before. [-] Fixed a crash found in Tatalia in MM7. [-] Inactive characters couldn't interact with chests. [-] Animated textures (via TFT) were animated incorrectly: first frame was longer, last frame was shorter. [-] My bug: ScalingParam2 was read from ScalingParam1 entry. [-] My bug: Mouse placed in the bottom-right corner was causing a crash sometimes. [*] Smarter FixInactivePlayersActing: now you can select inactive characters, but they can't act. [+] "NoPlayerSwap" hidden option. Set it to 0 to return player swapping and bugs it opens up. Awesome! Thank you! I have a question though. GrayFace wrote: Set it to 0 to return player swapping and bugs it opens up. Are you saying there's a chance it'll be buggy if player swapping is allowed? Anubis wrote: Are you saying there's a chance it'll be buggy if player swapping is allowed? Oh yes! Also, Lloyd pics wouldn't match actual beacons. Last edited by GrayFace on Mar 17 2019, 16:50, edited 2 times in total. I'd heard of bugs that one could use with player-swapping but I didn't realize the extent of which those bugs could be used. That video was crazy, lol. I only ever used the player-swap feature to use the Percival bow and fire at certain angles around corners. Last edited by Anubis on Mar 21 2019, 0:31, edited 1 time in total. GrayFace wrote: [+] "NoPlayerSwap" hidden option. Set it to 0 to return player swapping and bugs it opens up. GrayFace wrote: Oh yes! Also, Lloyd pics wouldn't match actual beacons. And thanks for the free advertising! In return would you mind taking a look at my post in the MMExtension thread? Last edited by Anubis on Mar 20 2019, 9:39, edited 1 time in total. Dunno if it's just me, but in the Free Haven sewers in the area where the Prince of Thieves is, there's a lot of distortion going on in that room and the lights are flickering on and off. When I look around in that area with my mouse, the distortion occurs. Donno if it's my PC tho or if everyone experiences that issue. Also, technical issue. Every time I press F4, the game switches to windowed mode and crashes. Got any suggestions to fix that or is there a way to disable the F4 key completely? Bug: Touching the "Evil Altar" in the Monolith (Silver Cove) says it grants +5 Personality to Druids and Clerics permanent. I don't have a cleric in my party but I have a Druid and +5 Personality was not granted to my Druid (It's a Greater Druid at this point if that matters). Bug: Loretta's Arch Druid quest -- You're supposed to touch the Altar during a Full Moon at midnight. I was able to interact with the altar at midnight during a Half Moon phase. Anubis wrote: Also, technical issue. Every time I press F4, the game switches to windowed mode and crashes. Got any suggestions to fix that or is there a way to disable the F4 key completely? Anubis wrote: Bug: Touching the "Evil Altar" in the Monolith (Silver Cove) says it grants +5 Personality to Druids and Clerics permanent. I don't have a cleric in my party but I have a Druid and +5 Personality was not granted to my Druid (It's a Greater Druid at this point if that matters). Looks like it only works for unpromoted Druids and Clerics. Exception EExternalException in module KERNELBASE.dll at 0011C632. Last edited by Anubis on Mar 22 2019, 17:13, edited 1 time in total. When you install the patch, there is a box for map fixes that says "leave unchecked if installing over a large mod" I had to check this because I am playing Mandate and the door in Castle Kriegspire leading to where the egg is won't open without it. If I now want to install a large mod, is there a simple way to change this or will I have to reinstall? So installing a mod will overwrite the previously installed patch and I just have to reinstall the patch without checking the box? If that's the case then I'm happy! Thank you. @Erisian -- I just realized something. You might have to delete 00 patch.games.lod and 00 patch.icons.lod (found in your Data folder) before re-installing GrayFace's patch...not sure. GrayFace will have to confirm, lol. Last edited by Anubis on Mar 29 2019, 14:30, edited 3 times in total. Anubis wrote: @Erisian -- I just realized something. You might have to delete 00 patch.games.lod and 00 patch.icons.lod (found in your Data folder) before re-installing GrayFace's patch...not sure. GrayFace will have to confirm, lol. i love your patch....except for one thing. you messed with the stat wells. you implemented your own opinion as to how they should work. 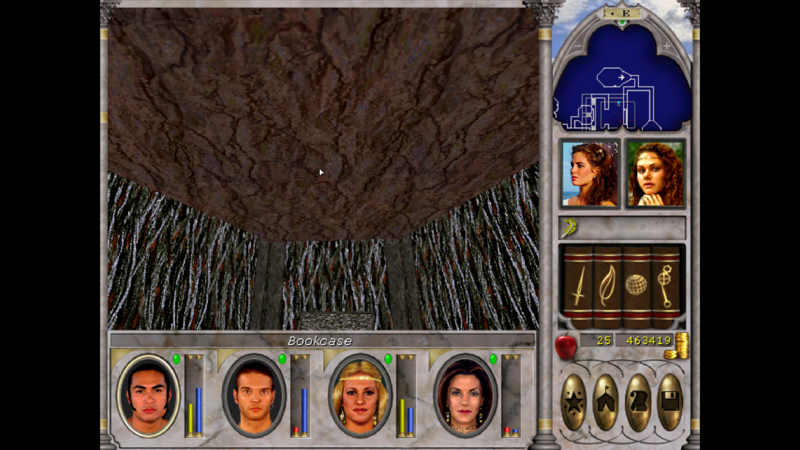 the experience well was intended to be just like the well in another might and magic game that gives certain bonuses. im not going to tell you which one it is because youll probably implement your own opinion as to how it should work with that one too.... now i can only drink from the experience well once per character. the wells that increase stats were intended to only raise a stat to 15 and could be revisited a week later. the only reason im complaining about it is because i handicap myself through most of the game by staying at lvl 1. those extra few points make a difference. Last edited by Munchies on Apr 7 2019, 9:32, edited 2 times in total.